This cold, rainy weather has us all feeling sorry for ourselves and looking at our overambitious New Year’s resolutions. 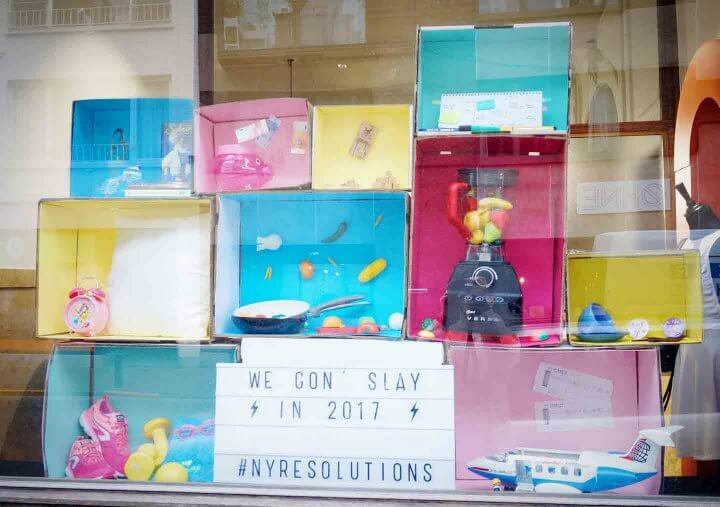 The Walkie Talkie squad listed 10 resolutions to live by in 2017, and to make sure we always keep them in mind, we displayed them in our window, spread over 10 different colorful boxes. This one is on the list every year, and it’s also one of the hardest to keep. But with a little help from our friends at Decathlon, 2017 should be the fittest year in history! WE WANT SUN! Do you guys know potential clients in Spain, The Bahamas or New Zealand? We’ll be needing a bigger plane, Playmobil! Money, time and while we’re at it, the earth! This one is meant for Wannes, our intern – his new Stabilo pens lie around all over the place. Less fried, more fruit. The IT&M blender will help us make the perfect smoothie or shake. That one’s pretty much just for you, Alexis (but we understand; those Carrefour coffee capsules for Dolce Gusto are just too tasty). It’s one thing to flick through fifty magazines every week, but it’s another one to dig into a 500-page classic! Luckily, our Neubau glasses will help us getting through chapters like they’re an Oscars best dressed list. In a nutshell, and as expressed by our all-time-idol Beyoncé : WE GON’ SLAY IN 2017!